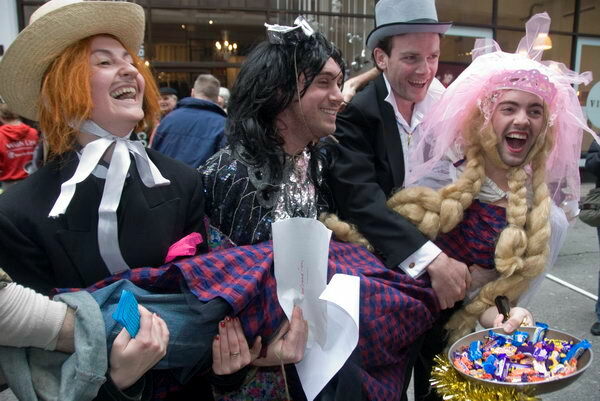 This year I just don’t have the energy for pancake races. 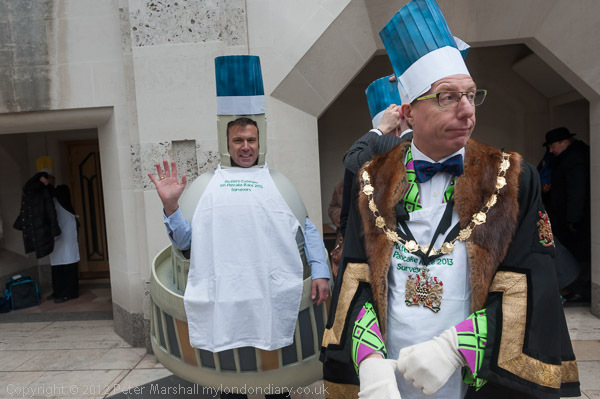 Not that I ever took part in them, but since I first photographed the Worshipful Company of Poulters Pancake Race in 2007 I’ve returned most years, as well as photographing other races in Spitalfields and elsewhere. 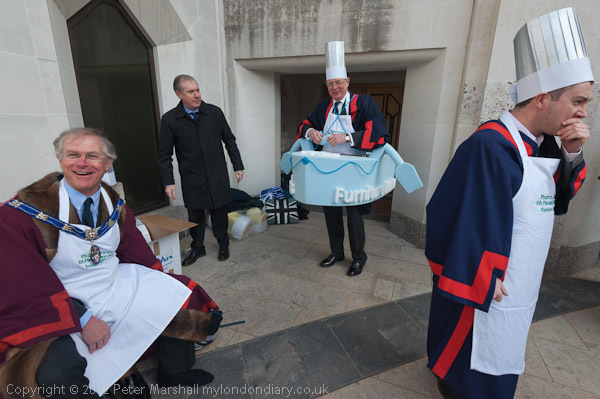 Like most of the other pancake races, this is a charity event, and one thing the City is not short of is money. And while I suspect that many of those taking part will be up to all sorts of dodges to (mainly legally) avoid paying tax they will at least be giving some of their ill-gotten gains to good causes. 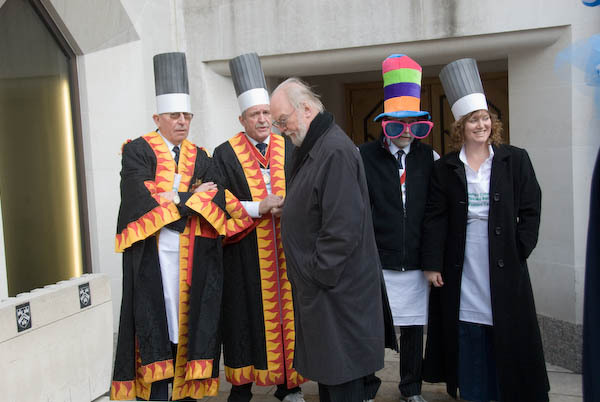 Its an event that often amuses me, with some very serious people trying hard to let their hair down and wearing very silly hats, but also one that shows how competitive the City can be – and with sometimes a certain amount of sharp practice despite elaborate rules and a large number of people observing compliance. Unlike the Guildhall race, this and three others are included in the Official Tourist Guide to London. It takes place in a rather more confined space making it difficult to take pictures for the crowds of others taking pictures. It starts a little later than the Guildhall event, but they overlap in time and it isn’t really sensible to try and cover both – so most years I’ve done so. The contestants here are teams, mainly from local businesses and there is rather more fancy dress, and rather fewer rules, most of which are broken. 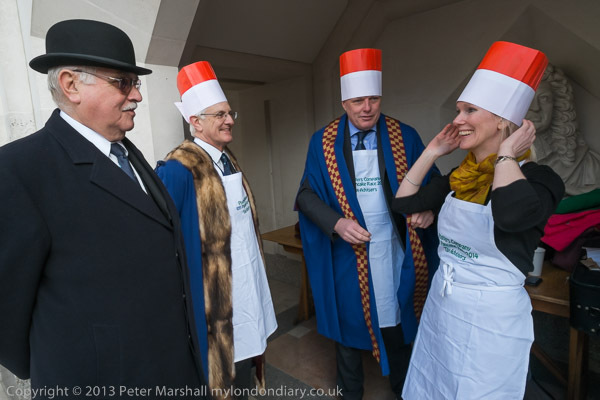 It’s much more straightforward fun than with the Livery Companies. 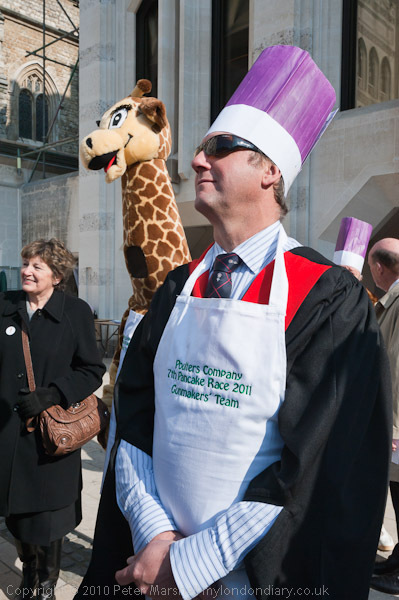 Another that I’ve photographed in the past – and is starting as I write now – is the annual race between media and parliamentarians in the Victoria Tower Gardens, which takes place too early to draw a very large crowd and is a rather more serious event. This is a highly organised and tightly fought race to raise funds for the charity Rehab – complete with a 32 page brochure for various sponsors to advertise in. 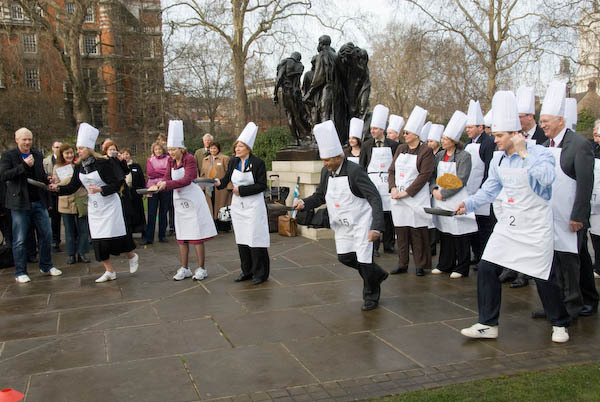 There are also an increasing number of other pancake races, mainly charity events around London, now including many suburban centres. I could even go and photograph one ten minutes walk away from where I live in Staines this lunchtime, and I may just stroll down there later, but I doubt it. I’m not a great fan of pancakes (and crepes really give me the creeps – such a food rip-off) and I feel I’ve photographed enough. * or 2004 according to the Clockmakers who ought to know. This entry was posted on Tuesday, February 17th, 2015 at 10:58 am and is filed under Uncategorised. You can follow any responses to this entry through the RSS 2.0 feed. You can leave a response, or trackback from your own site.